This Viewlex projector screen displays beautiful, crisp images on a matte white screen masked with black on all four sides. It's perfect for any home theater, office or educational environment. When you're done, it can be hidden away in housing case. Please don't worry about dust or mildew with a screen designed to resist both: the anti-dust anti-acid treated fabric is made to last and easy to clean, simply use a cloth and some water to clean. Besides, it is universally suitable for most LED, LCD or DLP projectors on the market. 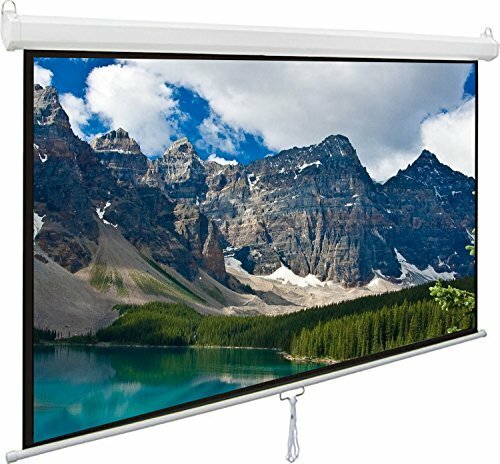 Viewing area size dimensions: 42.5" * 56.6"
Auto-locking system provides variable height settings. It is very simple to install and operate. Matt white projector screen can let you enjoy watching TV, Movies and games clearly presentation. Durable metal is casing for dual wall and ceiling installation design perfect for home or business. The black backing ensures that no light is lost so that projector screen can provide clear and vivid picture. Black masking border for optimum image focus and alignment and the screen material is durable and easy to clean. If you have any questions about this product by Viewlex, contact us by completing and submitting the form below. If you are looking for a specif part number, please include it with your message.